Two years ago Russell Westbrook earned MVP honors in large part because he became the first layer in 55 years to average a triple-double for the season. Last season he became the first player in NBA history to average a triple-double twice – made all the more impressive in that he did in consecutive seasons. So it should come as no surprise that Westbrook is at it again, currently averaging 21.2 points, 11.1 rebounds and a league-best 11.2 assists. He’s a near lock to average one a third straight season, needing to average just 8.3 rebounds and 8.0 assists over Oklahoma City’s final 28 games to do so. But Westbrook is currently set to make history for another reason involving his triple-doubles. Brodie has tallied triple-doubles in each of his last eight games, and on Thursday he surpassed Michael Jordan for the second longest streak in NBA history. In those eight games he’s averaging 19.4 points, 13.3 rebounds and 14.5 assists. He hasn’t exactly been efficient (41.5% from the field, 4.3 turnovers) but he’s a usage monster. In an event that should pique the interest of NBA Betting fans, he’ll have a chance to tie Wilt Chamberlain’s mark on Saturday night against the Houston Rockets on national television; Westbrook went for 21-9-9 in his first matchup against James Harden. We’re absolutely backing Westbrook to tie Wilt’s record on Saturday, given the importance of the game and, if we’re being honest, Westbrook’s love for chasing numbers. Naturally the Thunder have been better when Westbrook is at his best. While Paul George has actually been Oklahoma City’s best player, the Thunder still go as their point guard goes. 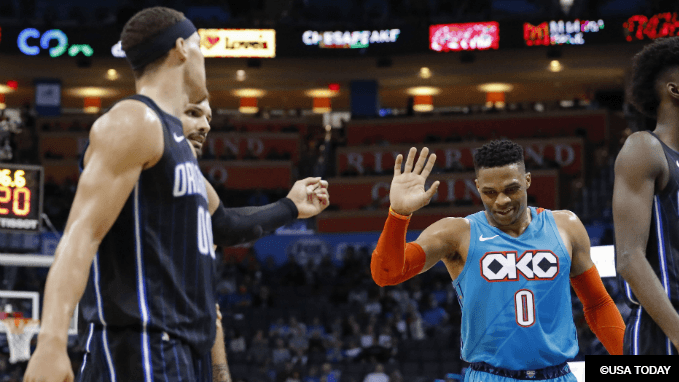 Since an ugly stretch in which they lost five of six – including one to the LeBron-less Lakers – the Thunder have won nine of 10 games and covered the spread in eight of those games. They’ve got wins (and covers) against the Sixers, Blazers and Bucks in that span and now have the NBA’s fourth best record against the spread at 31-23. We don’t see this train slowing down anytime soon. They’re a good play until further notice. In that span they’ve nearly caught the Nuggets in the Northwest. Denver hasn’t actually been all that bad, winning seven of their last 10, but in that stretch the Thunder have pulled within two games of Mike Malone’s squad. The Nuggets have won the first two matchups between these two teams so it’ll be difficult for the Thunder to win a tiebreaker if it comes down to that by the season’s end, which is one reason we’re still backing the Nuggets to hang on to their lead down the stretch with -143 odds on 888Sport.com. But if you believe Russ and PG13 can keep this going, the Thunder’s +300 odds look pretty good for the hottest team in the NBA. Whether anyone can catch the Warriors in the West remains the biggest question. They stood pat at the NBA trade deadline and their championship odds actually improved from -200 to -225. They’re -305 to win the Western Conference. But the Thunder are for real. They’ve got their star power in Westbrook and George, Steven Adams is having a career year and guys like Jerami Grant and Terrance Ferguson are growing up at a quicker rate than expected. Golden State is still the best bet for obvious reasons but there’s plenty of value in betting the Thunder at +1300 to win the West and +2200 to win a championship. At some point Westbrook is going to get over the hump, and the way he’s playing alongside George makes it feel like it could happen this season.